We've been hard at work. Two and a half weeks in to the school year. With my middle girl we've had a bit of a attitude problem. This is very unusual for her. She is overall very compliant and always wants to please us. I'm thinking she is a little hesitant this year, because we've changed spelling curriculum and added Story of the World. She likes things to be the same. She likes to know what's going on and what's coming next. I hope once she gets used to the new things that she'll become her old sweet self again. Right? Today we had some fun with flash cards. I don't think no one has ever done this before, but I hadn't come across the idea. So, in case you too haven't, I thought I'd share. We've been working on flash cards for math proficiency and the girls are usually fine with doing them the old fashioned way. Even the preschooler wants to do flash cards and is always saying "my turn". I usually just ask "what number is this?" and let her tell me either number on the card. Or she just randomly shouts numbers, as this is probably what it looks like we're doing. Today, just for fun we laid a group of cards down in a grid and used fly swatters. I'd ask the girls to slap a card who's sum was 8, or 5, or 12. What ever sum I felt like saying. Once they slapped the addends we'd flip the card over. 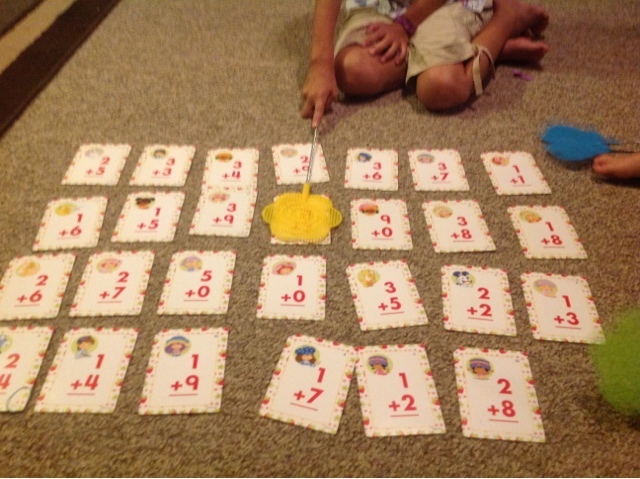 Example: I might say "find a card who's sum is 10". 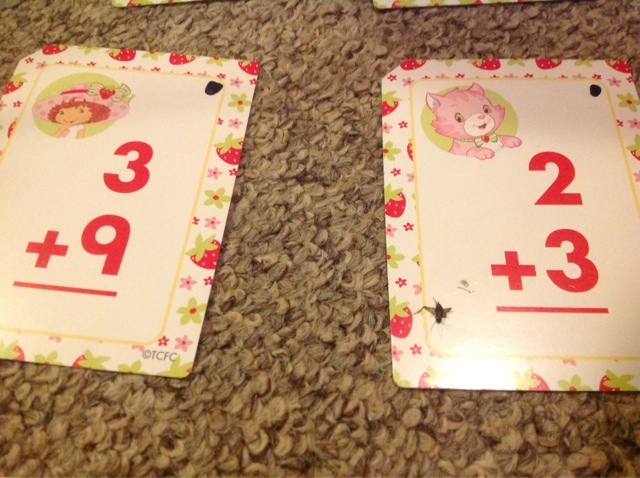 They could slap 2+8, or 9+1... Then we'd flip it over until all the cards had been flipped. Of course, little E wanted a turn and so I'd say "slap one that has a 5". Even a little cricket wanted to join our fun, but little E used her fly swatter a bit too effectively/literally. 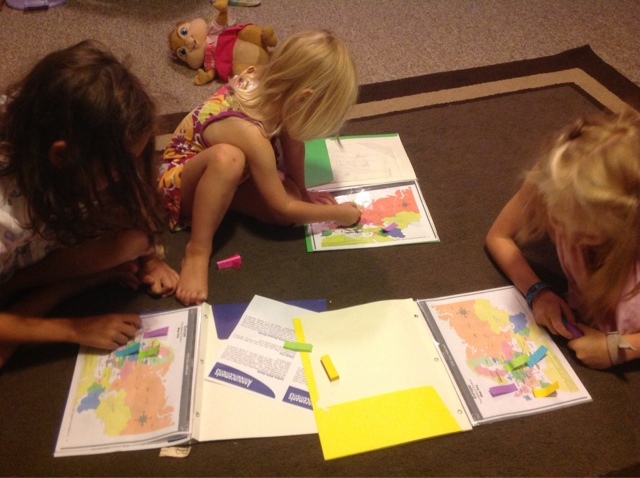 We also had some fun with geography. Who doesn't love sticky notes? Honestly, who? I got out our sticky strips, you know the skinny papers, but not the arrows. I said "put the purple on the North Sea" etc. until we went through all the European waters. Then we did a trace of Europe and labeled the waters. Hope you can use these ideas somehow.